There is no other floor type that captures the sheer essence and beauty, or enhances the cultural and historic feel of the Sonoran desert region that we inhabit like saltillo tile does. Made from the very earth of the general region itself, it naturally possesses that historic and cultural essence which can permeate and transform a home or place of business into a palpable environment. If installed, sealed, and finished expertly and with care, it can become a work of functional art, serving to pull together all the aesthetic components of a room for a striking, all-encompassing, and visually stimulating experience. As with any other creation, degradation is an ever-present threat, so proper maintenance and upkeep are critical to the continuation of its high-level condition and appearance. This article has been designed to inform you, the reader, and probable saltillo owner, as to those proper maintenance procedures, so as to protect your floor and ensure the longevity of its beauty. Routine maintenance of saltillo, regardless of the nature of the coating, should include weekly vacuuming and mopping with either plain water or a neutral floor cleaner. Ammonia-based cleaners as well as vinegar should be avoided as these products will degrade the coating and diminish the sheen, leaving the floor looking dull. Depending on the amount of foot traffic and other factors that cause wear and tear on the coating, the floor should be resealed at a rate of frequency based on these factors. Under normal conditions, once every two years is sufficient, but again, it depends on existing conditions. For the do-it-yourselfer, re-coating is a relatively easy process when performed with water-based floor finishes, but even so, there are precautions to be conscious of when doing so. Not all no-nos are articulated in the manufacturers’ application instructions, and there are a few. Two to three coats generally suffice in a re-coat and do wonders to return a tired floor to its original richness and luster. There comes a time in the life of all saltillo floors, though, when stripping and refinishing is required. The inevitability of this moment can be warded off dramatically through the routine maintenance procedures already discussed, but nonetheless will ultimately come. Knowing when that moment has arrived can sometimes be tricky. Over time, oil-based sealers gradually turn a progressively darkening amber color. Water-based finishes chip over time, leaving the floor with an appearance similar to peeling sunburnt skin. Both types of coatings are subject to what I call melding. Melding is when dirt and oils from foot traffic, dust, and kitchen spills become integrated with the coating. Anyone who has ever fruitlessly attempted to clean a saltillo floor knows exactly what I’m talking about. In many of these instances however, cleaning and re-coating can substantially improve the floor’s appearance. Sometimes, though, it’s just time to strip. Extreme competence, caution, and care are all musts in the performance of this procedure. If you have determined that your saltillo floor requires stripping, remember this – This step will be, for better or worse, and hopefully the former, the turning point in your floor’s future. The objective of stripping, and I can’t stress this enough, is to bring the floor back to the point it was at when it was first installed, with minimal or no damage to it in the process. Bare bones tile and grout joints are what you’re looking for. Never, ever let anyone attempt to strip your saltillo floor with a floor machine, as this will invariably damage it due to its uneveness and delicate nature. Saltillo should ALWAYS be stripped by hand. This is a hands and knees proposition that I don’t recommend at all for the do-it-yourselfer. Most saltillo floors, even if previously top-coated with a water-based finish, were originally sealed with an oil-based sealer of some sort, and most of the water-based floor finishes used to coat saltillo tile, here in Tucson, at least, are acrylic products which are highly resistant to normal stripping solutions. Methylene chloride is unquestionably required, then, for efficient, effective, and thorough stripping of saltillo tile. Methylene chloride is no joke, nor is the process for properly stripping saltillo. Methylene chloride can cause serious burns, dizziness, nausea and vomiting, as well as a variety of hallucinogenic effects. It should never be used without chemical resistant gloves and a good respirator equipped with organic vapor filters. The very best versions of methylene chloride are slightly thick and contain globs intermingled within the product that resemble chicken fat. Successful use of the product in stripping saltillo requires the tandem use of a water-based sealant stripper to keep the product soluble and subsequently workable. This is a two-man operation, with one person keeping the product and immediate area of operation wet with the tandem solution while the other person is stripping. Previously cut, black stripping pads are used for stripping the tile, while wire brushes are used on the grout joints. As stated previously, the objective is to remove ALL of the old coating. This may require multiple strippings. IMPORTANT: If remnants of an old coating are left on saltillo tile and/or its grout after the stripping phase, they will be visible through the new coating when it is applied and will give the floor a shoddy and amateurishly done appearance. 1. The presence of efflorescence, or white mineral deposits left from previously standing water from plant pots, pet water dishes, or water leaks. 2. Water stained tiles due to lateral migration of water into cracks in the tile and/or grout during the stripping process. 3. Cracked tile and grout due to normal wear and tear. 4. Little bits and pieces of the old coating remaining intermittently throughout the tile and grout. These issues must be dealt with before the prep is complete and refinishing begins. The solutions to potential peripheral issues won’t be covered here for time’s sake, but I’ll be happy to field any questions by email correspondence (catalinafloorcare@yahoo.com). After the entire floor has been adequately prepped, since saltillo is very porous, it is crucial that the floor be given ample dry time to guard against water becoming trapped from premature sealing. Should this occur, trapped water will eventually transpire through the new coating, making it peel and leaving behind efflorescence. I have found that two days of dry time is adequate (except under certain circumstances always involving poor air circulation within the home). Electronic moisture meters are the failsafe way of alleviating doubt if you’re unsure. When the floor is completely dry, it’s time to refinish. Knowing what type of coating to apply can be somewhat confusing since there are functional reasons along with the desired appearance to consider, and also what works and looks best with the particular type of saltillo being refinished. waters can be used after a coating of linseed oil. Before deciding what coating choice to make, it’s always wise to consult with the distributor and/or manufacturer of the products for added confidence in choosing. After refinishing is complete and your saltillo floor has been restored to its original beauty, remember that coatings have cure times of 48 hours for waters and 72 hours for oils. The coating is slightly soft during this time period, making it vulnerable to damage if care is not taken. If full-blown restoration, including stripping, is required on your saltillo, always hire a well-versed and well-seasoned flooring professional. 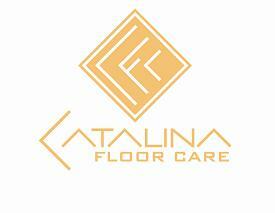 Welcome to Catalina Floor Care. You are now one click closer to a beautiful floor and a pleasurable, hassle-free experience in the process of getting it. 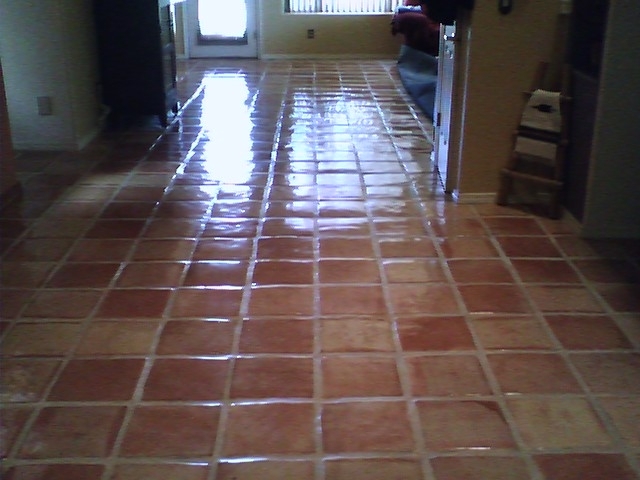 * Our saltillo tile restoration process is unmatched and unsurpassed by anyone, and produces stunning results. Catalina Floor Care is a local, family owned business with a focus on providing excellence, honesty, courtesy, convenience, and value for our customers. Call today and schedule a free estimate.